"Italia in Cucina, Live Cooking Day"
Master Chef Sebastiano Giangregorio of Antonio Vinoteca Ristorante Italiano in Cheongdam-dong, Seoul became a star Italian chef on March 11, 2010 when he served a variety of authentic Italian dishes to a group of guests at a posh restaurant in Seoul's Nonhyen-dong. Over 150 both local and international guests gathered at Arclinea Showroom were treated with the Italian dishes prepared by Sebastiano himself. Some Italian wine and champagne were also offered to the guests including Italian expats. Colorful dishes of salad, delicious sandwichs were also available at the restaurant. were risotto "con salsiccia e asparagi," pasta "rigatoni alla salsa pomodoro," and a ham "prosciutto." A lucky draw added a special flavor to the food tasting gathering. 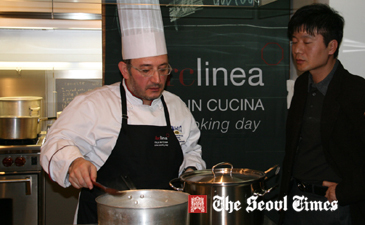 Mr. Sebastiano Giangregorio was there serving Italian dishes because he was chosen as the most representative Italian chef in South Korea by the Italian Ministry of Agriculture. Before coming to Seoul, Mr. Giangregorio worked at the top hotels in such countries as Hungary, England as well as his native Italy. On the day a total of 21 Arclinea showrooms worldwide celebrated the day by holding the event to present Italian cuisine at its finest under the auspices of the Italian Ministry of Agriculture. utilizing only the finest Italian ingredients. The entire culinary event was open to the public and kicked off at all 21 showrooms on March 11 (Thursday), 2010, from 7 to 10 p.m. local time. Arclinea proudly offered this dynamic event as an exciting extension of the Italian Ministry of Agriculture’s "Made in Italy" program, which served to further promote and protect authentic Italian products worldwide. Commitment to supporting Italy’s revered culinary history and rich raw materials remains the mission of the Italian Ministry of Agriculture. Authentic Italian products of the highest standards in quality are a trademark and treasure of the country. It is not only the guidelines, ingredients and time-honored recipes that distinguish these products, but also the wealth of distinctive regional flavors, traditions and agricultural landscapes that contribute to products grown and produced in Italy. The Ministry upholds a “zero tolerance” policy against imitation Italian food & wine available on the market and strives to expose these products to the public. The collaborative efforts by the Ministry and Arclinea will support this policy in an engaging and experiential way for the public. Arclinea was established in 1816 as an artisan business specializing in woodworking with an emphasis on quality. After over a century of interruption caused by war within Italy, Silvio Fortuna Sr. resumed the business started by his great grandfather, beginning a new venture in custom furniture. In 1960, Fortuna’s company was renamed “Arclinea,” an Italian word reflecting the company’s longstanding philosophy of creating functional and modern furniture where ease of use is the standout characteristic. Today, Arclinea is a prestigious and internationally recognized brand with over 300 sales locations worldwide. Each Arclinea kitchen reflects the careful attention to design and precise planning to create a unique living and working experience. 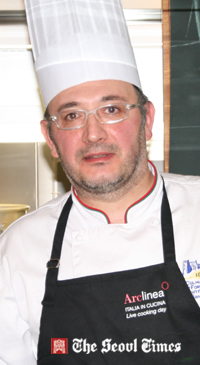 For more information, please visit ITALIA IN CUCINA specific area at: www.arclinea.com.